More than 4,300 developers gathered in Copenhagen this past week for KubeCon Europe 2018 + CloudNativeCon, a conference focused on the use of Kubernetes, microservices, containers, and other open-source tools for building applications for the web. Containers are an open source technology that lets an application be packaged with everything it needs, to run the same in any environment. They offer the versatility of virtual machines — but at a much smaller footprint and cost. This makes containers a superb vehicle for getting applications to private or public clouds, and for lending greater agility to DevOps. As application development teams are pressured to deliver software faster than ever, containers offer clear advantages. A Forrester study found that 66% of organizations who adopted containers experienced accelerated developers efficiency, while 75% of companies achieved a moderate to significant increase in application deployment speed. The use of containers is undoubtedly one of the hot topics in the IT industry at the moment. According to predictions from 451 Research, the market is set to grow from $762 million in 2016 to $2.7 billion by 2020 as businesses continue to leverage the performance, cost efficiency, and scalability benefits for running applications in the cloud. Despite the technology’s growth in popularity, there are still some significant industry challenges that need to be overcome. From re-architecting legacy apps, to a lack of developer experience and ensuring application security, it isn’t all plain sailing. The promise of container technology, however, is clearly evident, which is why the industry has seen an explosion of start-ups appearing in recent months and years. With a focus on building, managing or providing container services, these start-ups are adding to the plethora of container-based solutions released by virtually all the major cloud providers and vendors. 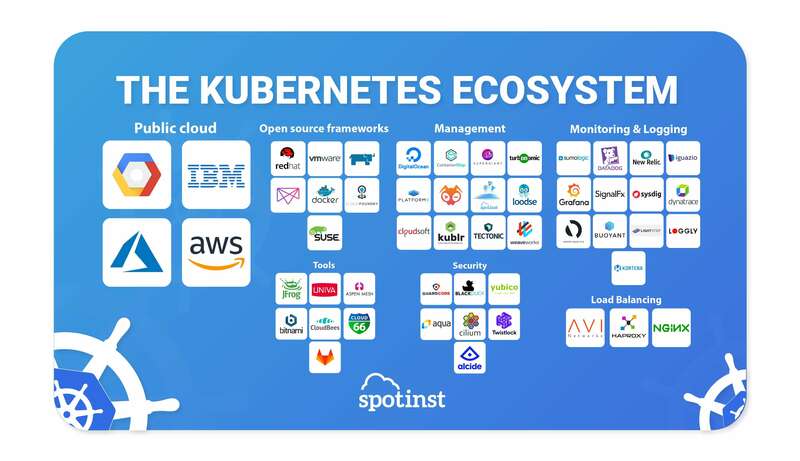 In this blog post, Spotinst will map out the key players in the Kubernetes ecosystem, from the well-known industry leaders to innovative start-ups solutions that aims to disrupt the industry. One of the founding members of the Cloud Native Computing Foundation, and the original creator of Kubernetes, the company made several announcements throughout the week. That included the beta release of Stackdriver Kubernetes Monitoring, the decision to open source a container security tool called gVisor , the creation of an open source sandbox for containers dubbed Shentu and Asylo, an open-source framework for confidential computing. The Azure Container Service offers simple deployments of one of three open source orchestrators: DC/OS, Swarm, and Kubernetes clusters. Simplify the deployment, management, and operations of Kubernetes on MS Azure Infrastructure. CCP for a multi-cloud world automates the repetitive things and simplifies the complex ones so everyone can easily use containers. Cisco invests in many open source projects such as Istio, a service mesh platform to connect, manage, and secure microservices that span between private data centers and public cloud providers. Amazon Elastic Container Service for Kubernetes (Amazon EKS) is a managed service that makes it easy for you to run Kubernetes on AWS without needing to install and operate your own Kubernetes clusters. Amazon EKS is certified Kubernetes conformant so you can use all existing plugins and tooling from the Kubernetes community. Amazon EKS is still in Preview. Red Hat’s is the second largest contributor to the Docker and Kubernetes codebases and works with the Open Container Initiative and the Cloud Native Computing Foundation. As with all open source projects, Red Hat contributes code and improvements back to the upstream codebase—sharing advancements along the way. Openshift, by Redhat, helps you to automate the build, deployment, and management Kubernetes applications. On KubeCon it announced it would share an open-source toolkit to manage application instances on Kubernetes called Operator Framework. SUSE CaaS Platform is an enterprise-class container management solution that enables IT and DevOps professionals to more easily deploy, manage, and scale container-based applications and services. CaaS platform includes Kubernetes container orchestration technology, container engine, image registry, SUSE MicroOS, a purpose-built OS to run containers while delivering the security, scalability, and the robustness of SUSE Linux Enterprise and complementary open source technologies that supports Kubernetes extensions. vSphere Integrated Containers provides critical enterprise container infrastructure to help IT Ops run both traditional and containerized applications side-by-side on a common platform. Their three major components are vSphere Integrated Container Engine, Container Management Portal and Container Registry. Previously supporting Mesos and Marathon as a default containers scheduler, Mesosphere DC/OS now lets you automate workload-specific operating procedures to “as-a-Service” anything from Kubernetes to data services and provides a platform for building, deploying, and operating data-rich, containerized applications in your data center and on public clouds. Docker and Kubernetes integration allow developers and operators to build apps, test and deploy apps seamlessly when using both Docker Swarm and Kubernetes. Docker EE is the enterprise-ready container platform that manages and secures applications on Kubernetes in multi-Linux, multi-OS, and multi-cloud customer environments. Rancher is an open source software that combines everything an organization needs to adopt and run containers in production. Built on Kubernetes, Rancher makes it easy for DevOps teams to test, deploy and manage their applications. Operations teams use Rancher to deploy, manage and secure every Kubernetes deployment regardless of where it is running. Ballerina is a programming language optimized for integration and it is being developed by WSO2. With Ballerina, it’s very easy to write integration services. The open source application development technologies offer a CF Container Runtime that gives you more granular control and management of containers with Kubernetes. Kubernetes and CF BOSH help you manage the deployment and lifecycle of your environment, you can achieve high availability for Kubernetes clusters, as well as scaling, VM healing, and rolling upgrades. Datadog allows you to get metrics from Kubernetes service in real time to visualize and monitor Kubernetes states and be notified about Kubernetes failovers and events. On KubeCon it introduced Prometheus support for Datadog Agent 6 and a new container map view in Datadog. The Sumo Logic App for Kubernetes allows you to monitor Kubernetes deployments The preconfigured dashboards present resource-related metrics at the Kubernetes pod, cluster, and namespace level; and provide operational insight into Kubernetes components, including nodes, the API Server, the Controller Manager, the Kube System, and the Scheduler. New Relic Infrastructure on-host integration for Kubernetes, providing monitoring of the container orchestration layer so you can view, troubleshoot, and alert on the most important parts of your cluster. This integration collects metrics that monitor data and metadata for nodes, Namespaces, Deployments, ReplicaSets, Pods, and containers, so you can fully monitor your frontend and backend applications and hosts running in your Kubernetes clusters. AppDynamics for Kubernetes provides enterprises running traditional or microservice-based applications on Kubernetes an end-to-end solution to deliver flawless application experiences. Conduit is an open source service mesh designed for performance, power, security, and ease of use when running applications on Kubernetes. Released Version 1.0 of Linkerd, the open source service mesh that has become one of the official projects of CNCF. Turbonomic provides continuous workload placement actions at the container and VM level based on container demand for memory, CPU, and the available supply of VM and host resources including CPU, memory, network, IO, ready-queue, and swapping and ballooning. Replex provides solutions to correlate information between Kubernetes clusters and the underlying infrastructure like AWS, GCP or Azure. It provides actionable information on the utilization, efficiency and cost structure of applications deployed within Kubernetes. Grafana allows you to Monitor a Kubernetes cluster using Prometheus TSDB. It shows overall cluster CPU / Memory / Disk usage as well as individual pod statistics. The Instana Kubernetes monitoring sensor automatically detects the containers running in the service and the platforms running on the containers, deploying additional sensors to gather performance metrics of the full application stack. Dynatrace provides full monitoring insights into the hosts and applications you deploy with Kubernetes, including, automatic detection of dependencies between containerized applications, root cause analysis and the ability to replay problems to see how they evolved over time, application availability and performance monitoring. Prometheus is an open-source system monitoring and alerting toolkit originally built at SoundCloud. It fits both machine-centric monitoring as well as monitoring of highly dynamic service-oriented architectures. In a world of microservices, its support for multi-dimensional data collection and querying is a particular strength. Announced this Kubecon, Spotinst MCS provides a full package of provisioning Kubernetes Cluster via Kops or UI and managing its Infrastructure on Spot instances – reducing compute costs by 80%. In addition, it provides a “Serverless” experience for the infrastructure management in the cluster. as MCS responsible for scaling capacity up & down to accommodate changes in containers deployments. Seems like DigitalOcean is working on providing soon a managed Kubernetes product that is designed for developers and businesses who want to run on their cloud. Giant Swarm provides organizations with the ability to launch Kubernetes clusters easily. 24/7 management and enterprise support. Platform9 is a SaaS managed solution that enables deployment, monitoring, and maintenance of Kubernetes across bare metal, Linux, OpenStack, vSphere and major public clouds. 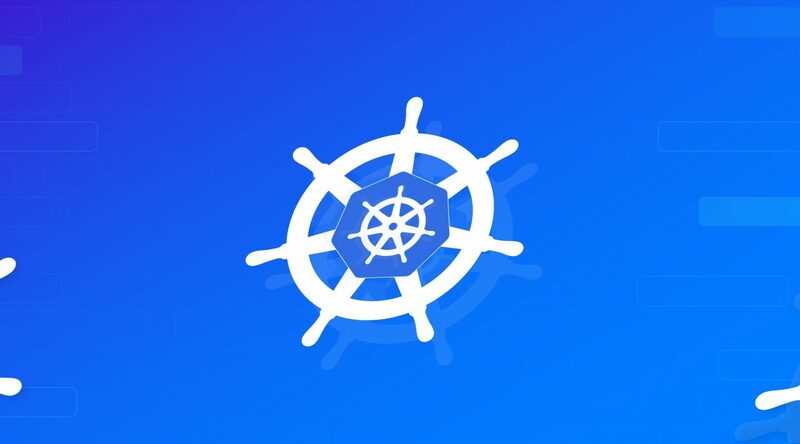 Kublr is an enterprise-grade Kubernetes management platform. It automates the deployment and management of clusters and environments. Kublr configures and manages each layer of a Kubernetes deployment, including the infrastructure, components, and additional functionality on top of Kubernetes. Envoy is an L7 proxy and communication bus designed for large modern service-oriented architectures. Ambassador is an open source distribution of Envoy designed for Kubernetes. Ambassador uses Envoy for all L4/L7 management and Kubernetes for reliability, availability, and scalability. Ambassador operates as a specialized control plane to expose Envoy’s functionality as Kubernetes annotations. AVI Networks provides a centrally orchestrated, elastic proxy services fabric with dynamic load balancing, service discovery, security, micro-segmentation, and analytics. The AVI Vantage Platform provides a container application networking platform for container-based applications running in OpenShift and Kubernetes environments. HAProxy Technologies, developed solutions and features that enable integration of HAProxy with Kubernetes and other dynamic environments. It can be used as a Kubernetes Ingress Controller in order to fully supported HAProxy installation, real-time dashboard, management, and security-focused add-ons. NGINX Plus is an advanced Layer 7 load‑balancing solution for exposing Kubernetes services to the Internet, whether you are running Kubernetes in the cloud or on your own infrastructure. The Kubernetes ingress specifications combined with the nginx-ingress-controller gives a flexible and powerful routing platform for Kubernetes clusters. Aqua provides development-to-production security controls for cloud-native applications that run on-premises or on any cloud, on Windows, Linux or in on-demand container-as-a-service environments, using any popular orchestration platform. Black Duck has developed a scalable security solution for containerized application delivery within a Kubernetes environment. Black Duck OpsSight for Kubernetes proactively monitors all container images within a Kubernetes cluster, providing visibility into, and control over the risks associated with open source components in those container images. brings API-aware network security filtering to Linux container frameworks like Docker and Kubernetes. Using a new Linux kernel technology called BPF, Cilium provides a simple and efficient way to define and enforce both network-layer and application-layer security policies based on container/pod identity. Twistlock provides container security for teams using Docker, Kubernetes and other cloud-native tools. From securing containers at runtime at scale to enforcing compliance across the CI/CD pipeline, Twistlock is a centralized platform for protecting applications against active threats. Alcide provides a cloud-native security platform that protects any combination of containers, VMs, serverless and bare metal. Alcide empowers DevOps, Security and Engineering teams with controls to manage and secure the evolving data center and hybrid cloud. Frog’s solution is an automated pipeline for distributing trusted software releases. JFrog Artifactory can be used to store and manage all of your container application images, deploy to Kubernetes, and also set up a build, test, and deploy pipeline using Jenkins and Artifactory. Is the hub of enterprise Jenkins and DevOps, providing smarter solutions for continuous delivery. Univa helps you automate workload placement, multi-tenancy and policy management solutions for fKubernetes that plug into any Kubernetes distribution to maximize shared resources and manage service applications. Bitnami provides solutions for how containers will be packaged and delivered. Kubeapps console helps your Kubernetes cluster with deploying apps. Kubeless provides a FaaS that runs on top of a Kubernetes cluster, that is CLI compatible with Google cloud functions and supports Python, Nodejs and Ruby language runtimes. 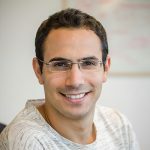 Bitnami uses Helm to provide installation of applications into a Kubernetes cluster by packaging them into self-contained units called Charts. Aspen Mesh makes it easy to manage the inherent complexity of microservice architectures. The SaaS solution provides the observability, security, and insights to manage microservices for Kubernetes containers. GitLab CI/CD lets you easily manage deployments to multiple environments. Run automated tests in parallel with auto-scaling GitLab Runners. Manually test changes in a live, production-like environment before merging code with Review Apps. Runners, reviews Apps, and your own application can be deployed to your Kubernetes cluster or any environment you choose. If you are not mentioned and believe you should, please contact ido@spotinst.com and we would be happy to add you to the list!